The classroom was in a home in West Newton, MA. Class were every Tuesday and there wasn’t any homework. And the one and only student had already graduated from college. These lessons were about life, and about death, as related by Mitch Albom in his book Tuesdays With Morrie. 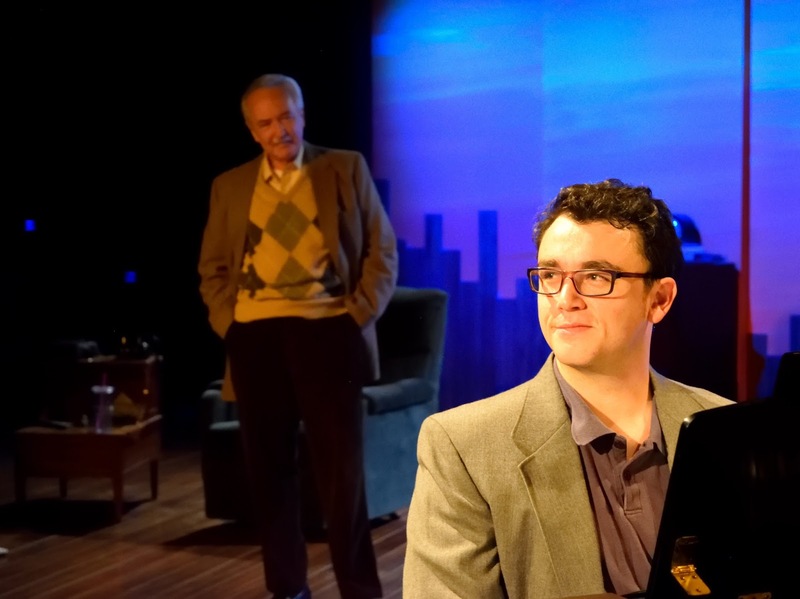 He and Jeffrey Hatcher have combined to turn the book into a one-act stage adaptation, getting a fine production at Playhouse on Park. Chris Richards stars as Mitch, who having discovered that his sociology and mentor at Brandeis University is dying of ALS (Lou Gerhig’s Disease), travels from his home in Detroit to pay a visit after not having kept in contact for 16 years. For Mitch, there is a sense of duty, a deire to pay his respects, and a nagging curiosity about death. Morrie (Gannon McHale) is happy to see his former student, who has made quite a name for hiself as a sports reporter and columnist. The first visit is a bit awkward, as Mitch feels guilty about not having kept in touch with his “Coach,” but Morrie is overjoyed. The disease is progressing, but Morrie still feels he has a few things he can teach Mitch, who agrees to visit every Tuesday. Armed with a tape recorder, the journalist comes each week with a list of questions, and what transpires is a lesson on what’s important in life and how to face death. Morrie wishes he had realized the importance of being with people he loved and telling them that he loved them. He hopes that Mitch, troubled with issues of intimacy in his marriage and struggling with the need to be successful in his career, will take his advice and find enjoyment in life. Sasha Bratt directs the intimate two-hander which offers effective performances, particularly from McHale, who effectively portrays the devastating effects of the illness and Morrie’s struggle to maintain dignity while trying to live life to the fullest – at least as full as the disease will allow. Richards is a good foil as the uptight, scoffer who fears the love he has for Coach and allows himself to feel it. There wasn’t a dry eye in the house the night I saw it, so bring some tisues. The action is played out, and told in some narration, on a minimal set designed by Christopher Hoyt, effectively lighted by Aaron Hochheiser. Sound effects are added (Joel Abbott, design) to help take us out of the room and remind us of a world taking place outside the talks about life and death. Albom and Hatcher’s script is plied with humor throughout to keeo the topic from being too morose. Catch this slice of life . . . and death at Playhouse on Park, 244 Park Rd, West Hartford through Oct. 18. Performances are Wednesdays and Thursdays at 7:30 pm, Fridays and Saturdays at 8 pm, Sundays at 2 pm. Tickets $22.50-$35 www.playhouseonpark.org; (860) 523-5900 x10. • Tuesdays With Morrie book club, meetings Oct. 6 and 18. Call the box office or visit the website to register.